How to sell domains with "Domain for sale template theme"? HomePremium domainsHow to sell domains with "Domain for sale template theme"? If you want to involve in domain flipping, then buying and selling domains for profit can be a lucrative business. If you want to sell premium domains, you need to promote your domains to get more people interested. Sites such as Flippa give you the opportunity to find customers for your web properties but you can also opt for “Domains For sale template” to sell your premium domains. By doing this, you can eliminate to pay high commission rates. You can also sell your domain directly to interested people. You need an user friendly, responsive domain for sale template. Any interested party who lands on your "Domain for sale template" page can directly send you an offer price. Once interested parties landed on your page, it is easy to get offer from them but how to bring interested people on landing page is still a rocket science mystery. You have to do a lot of activities behind the scene to market your domain names. You have to reach potential buyers, startups and companies and show them your domain names. Here the main important thing is exact targeting of your domains, it should be targeted to the right audience and you should know why this domain is of so much importance for their business. Here your marketing skills will be tested. If you able to land these potential leads to your domain sales landing page then you can easily sell the domains. I will cover complete case study of domain flipping later on. inTime is a responsive, clean and modern domain sale WordPress plugin. This plugin has a design which is being packed with many features. It has many features like WordPress 3.8+, Allow access filter by IP, roles, Enable and Disable coming soon on some specific pages, Responsive layout, Retina display ready Full screen image, social links etc. This domain is for sale – This template can help you to get buying offers for your domain names from the visitors itself instead of using a domain marketplace! It has great features like works with any theme, SEO statistics, automatic plugin update, affiliate links etc. My domain list - This template again can be used to promote, manage and sell the inventory of domains. You can also use it to keep track of expiration dates and domain registrars of your domains. Domain names checker - This plugin uses a single short code to get a Domains Names Checker on your blog. The plugin can run in 2 different search modes. You can decide to use the service you wish. You can also turn on the caching of the search results, and even fix the caching removal period meaning for how long you want to wait before the results are refreshed. Domain Sales Template- This is again the best template we have designed to capture Premium domains leads from potential customers. Check this- Domain Flipping template. Thus, these are a few premium domains for sale templates themes which helps to make your landing page look attractive and inviting to any buyer. 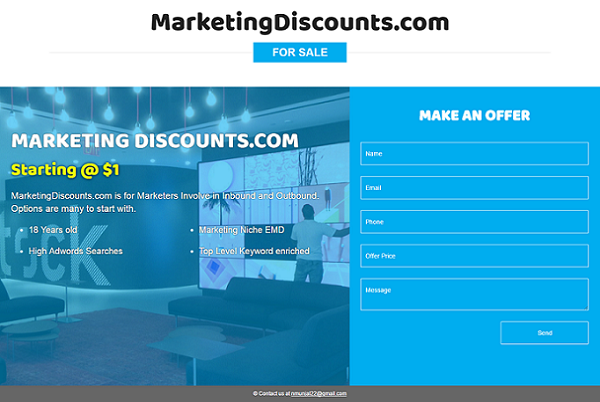 These templates have all the features that people look for in a sale template and have made the life of domain sellers much easier. Thus, there is no need to worry anymore about selling your premium domain. You can do that easily today with ease and comfort. I hope above “Premium Domains for Sale template” and plugins would help you.